I was a bit critical in my last post about the NFL.com website redesign, and the failure to account for existing incoming links to the site from pro football bloggers and elsewhere. imagine how hard it was to get this league site back up off the ground!!" It’s a point very well taken and something I should have mentioned previously. The depth of content that the NFL has to deal with for their site is simply astounding. NFL.com is not just a site for news stories of all things National Football League, it is a trove of data on individual games, teams, players–and now historical data on all of the above–as well as video and photographs. The list goes on. The programming and logistics of bringing all of that together into a coherent and usable whole is pretty staggering when you think about it. So, yes, I second Pat’s sentiments, however belatedly. But I do write about Internet marketing and after further review of the site, I’ve found something else lacking from an Internet marketing point of view. I won’t go into great detail about NFL.com’s new features (for that see BizOfFootball.com and Rotanation.com via Pat Coyle and DigiSpo). I will, however, share a few of my favorites. NFL Video: The site has a ton of video, including player highlights, game previews and recaps, and NFL Network programming. NFL Photos: Complete photo galleries for each game and more. NFL Statistics: In addition to all statistics you’d expect from a professional sports site, the new site offers splits, and, best of all, historical data that is even game-specific. As an Old Skooler, I can look at how Vikings Hall of Fame quarterback Fran Tarkenton performed for each game of the 1974 season right up to Super Bowl IX, when the Vikings lost to the Steelers. It’s all very cool and there is a lot of content to make football fans happy. If you want to market online, content is definitely king these days. As I’ve said before, content needs to be embeddable because, as Steve Rubel points out, traffic happens elsewhere. This is especially true for professional sports. I’d be willing to bet that there is a far higher proportion of sports and political bloggers than there is for any other content category. Both love to talk about their passion online. And people like to read them. I love to blog about sports and I’d love to be able to cut and paste some video highlights of the last Vikings game, for example, to highlight my points without requiring my readers to go offsite. But doing an iffy proposition because clips of NFL games on YouTube are constantly being taken down, so, instead of broken links, I’d have broken videos on my site. Professional sports teams are notorious for clamping down on their content and there used to be good reasons for that. But now I think their just swimming upstream and failing to exploit an opportunity at the same time. 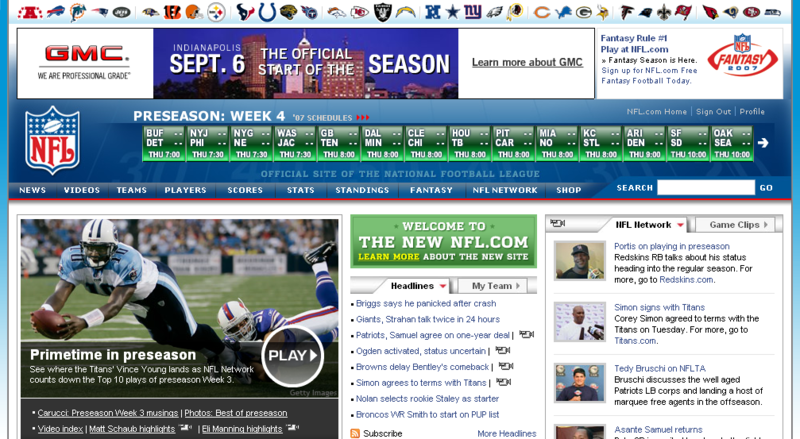 The new NFL.com site goes right up to the door of the sharing Web but refuses to cross the threshold. The site is completely RSS-enabled; I can subscribe to a feed of just Vikings news or videos, so I am alerted when there’s new content. I can email and link to but not embed Vikings game highlights. I can only email photos, and even then not to specific ones but to photo sets. All of the "sharing" features are designed to drive traffic to the site rather than marketing to people where they are at. It would be simple to include a pre-roll ad in the embedded videos. 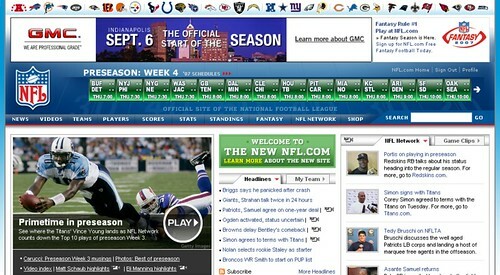 You could allow people to only embed small photos and require a link back to the high quality, large photos at NFL.com. Sports bloggers wouldn’t mind that. In fact they’d love it, reasoning that it’s the price they pay for the content. Bloggers are trying to build an audience, too, by creating their own quality content, so they’re not inclined to send their readers elsewhere when they don’t have to. But they’re perfectly happy to share their audience, on site, and even host advertising without charging for it, as long as they can embed the content they want to embed. Embedable content is, indeed, a win-win situation for both the content provider and those who are embedding their content. But sadly for both parties, pro sports seem loath to fully embrace the spirit of Web 2.0. The NFL.com redesign can be classified as a Web 1.5 site, illustrating that pro sports seem loath to fully embrace the spirit of Web 2.0.